There is no end to sad situations for donkeys and all animals. 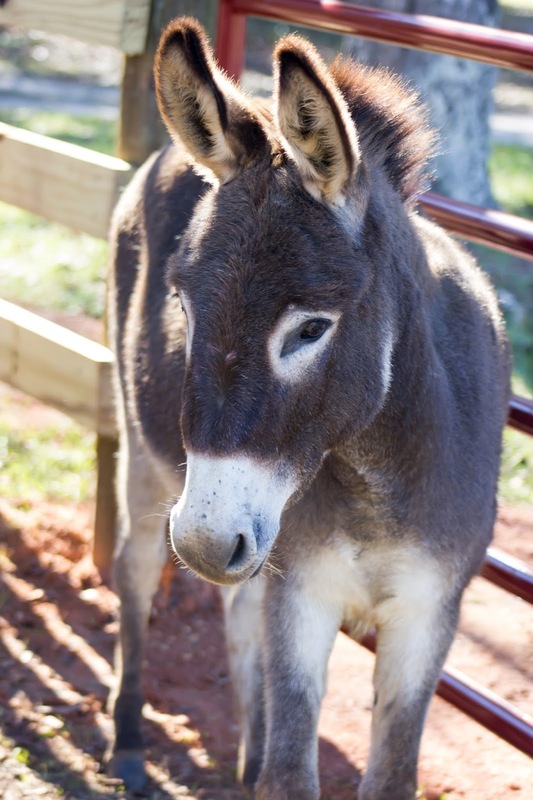 Last November, we received an urgent call regarding 11 donkeys abandoned in a large field in Middle Georgia for an undetermined length of time. 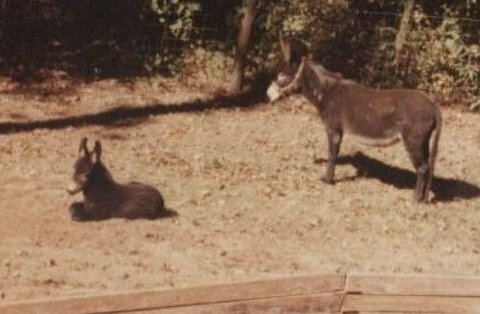 After placing a jack and jenny in his pasture, the original caretaker had had a stroke and the donkeys were left to fend for themselves. They were discovered when the fencing began to fall down and the donkeys were entering others people’s property and were out on local roads. Being a small rescue organization, Amberwood Sanctuary is not in a position to rescue so many animals at one time—we did not and do not have the personnel or the funding necessary to handle such a large event. But no one, including local law enforcement, would take any steps to help them, and there was some talk of shooting them. Without immediate action, this obviously desperate situation was only going to get worse and their doom was sealed. Our beautiful “historic” incoming barn had been renovated through the donations of many caring people and a grant from the American Society for the Prevention of Cruelty to Animals, but we did not have adequate funding to complete the replacement of the very old and decrepit fencing of the attached corral and small pasture. In preparing to rescue the Dodge County Donkey Family, we pulled money from other budgeted items and completed the incoming area. After a lot of work and worrying, the donkeys arrived on December 11, there being four grown jennies, two grown jacks, three baby jennies, and two baby jacks. With probably all four grown jennies pregnant, a little jenny (Madison) was born on April 23. Of course, the two grown jacks were castrated immediately on their arrival. Not having any human contact, they are feral, with the extraordinary exception of a 2-month old jenny (Priscilla) who walked right up to me on her first day here and let me pet her. Donkeys are naturally very cautious animals and are careful in giving their trust. 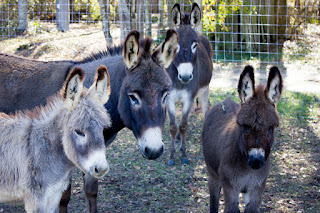 Now, several months later, there is a small entourage of donkeys who usually meet me at the gate and follow me around: along with Priscilla, Sammy, Maya (all babies), and Madison (the newest baby, after about two months of not allowing me to touch her at all). Joey, the father and grandfather of the family, will come to me. Gretchen (mother and grandmother of the family), Jasmine, and Mariah will allow me to pet them sometimes. All the rest, three grown, one baby: no! (Delaney, Laurel, Hamilton, Cheyenne). I’m still trying to remember everyone’s name! 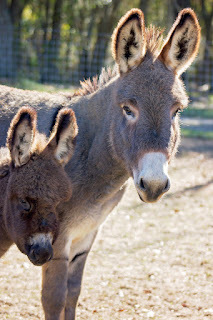 Donkeys are very territorial and do not readily accept newcomers into their herd, so there is always the possibility that a grown jack could harm a small foal he does not know. With six young foals in this family and the babies still to come, it became necessary to expand our incoming area in order to accommodate this many donkeys for a much longer than normal period of time. We’ve added part of our main pasture, temporarily, to the incoming area pasture. Because this was an extreme emergency for the sanctuary and for these poor, abandoned donkeys, we sent out a desperate newsletter to all of you, asking for your help. And help, you did. The response was overwhelming: Everyone cared about these donkeys and the unfortunate situation they were in. 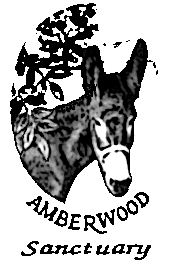 Your love and generosity, shown through the donations and kind notes we received, saved the lives of the Dodge County Donkey Family. From the bottom of my heart: Thank You! 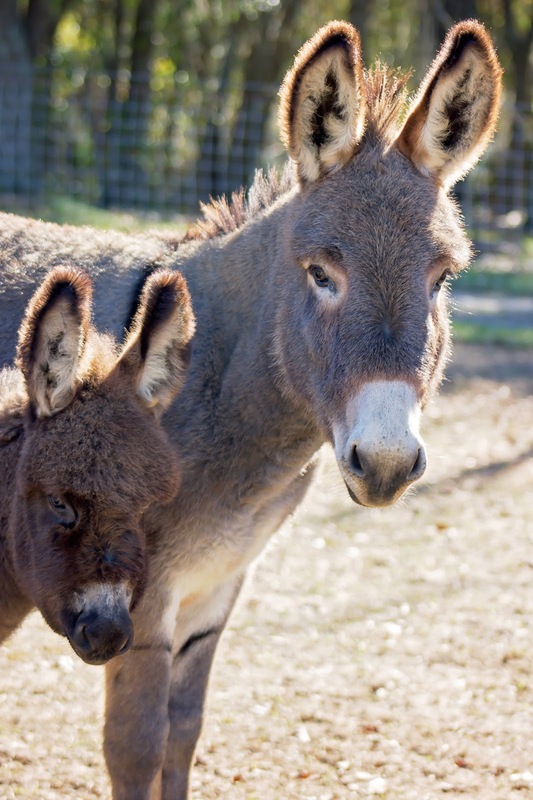 We could not rescue and care for these precious donkeys without you!